Don't let the Koala fool you. It's one of the most powerful inflatable blowers that we have to offer. It's small size can be deceiving, but it still delivers. The 1 HP motor delivers an air flow of 634 CFM! That is approximately 20% more powerful than our more economical inflatable advertising air blower. 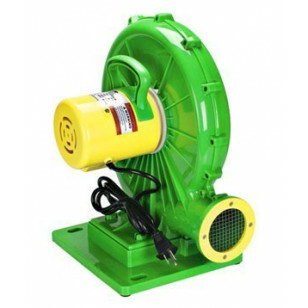 The Koala is very efficient UL registered blower. The UL rating certifies that this product is safe for public use, which is very important for a blower of this nature. It is recommended for use with bounce houses 15' x 15' or smaller. For something that can handle even larger houses, please take a look at our 980 CFM children's inflatable bounce house blower. Fan locks into place on the durable baseplate for added stability. UL rating certifies that this large bounce house blower is safe for public use. Built in handle and lightweight design (only 18 lbs. ), make it extremely easy to transport. 6 month warranty on all parts except the power cord. This is a review for the Large Bounce House Blower.